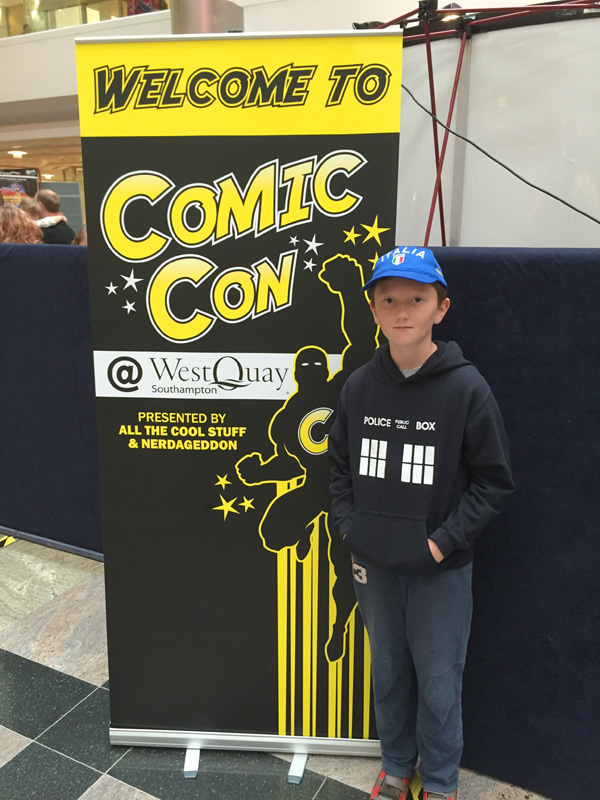 Welcome to my latest post which is all about my visit today to Comic Con @ West Quay. 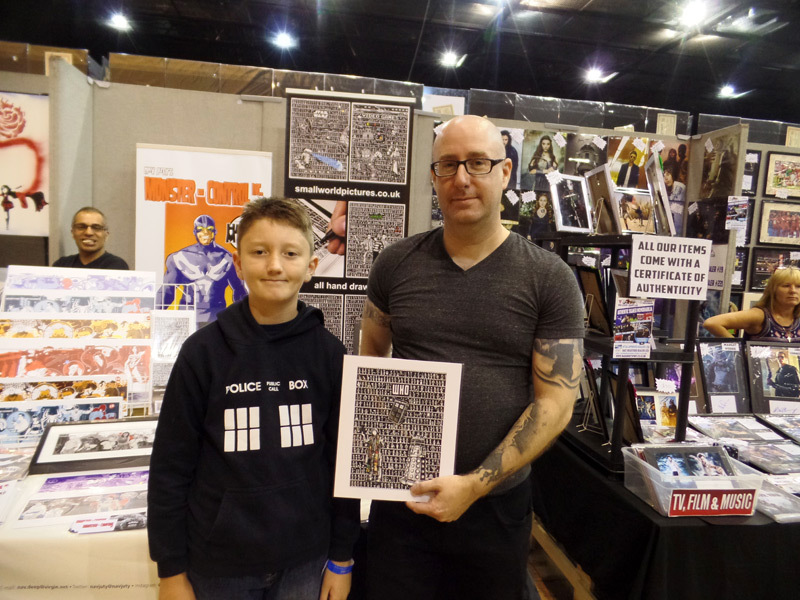 This is the first free to enter Comic Con in Southampton, presented by All the Cool Stuff and Nerdageddon and I decided to check it out! 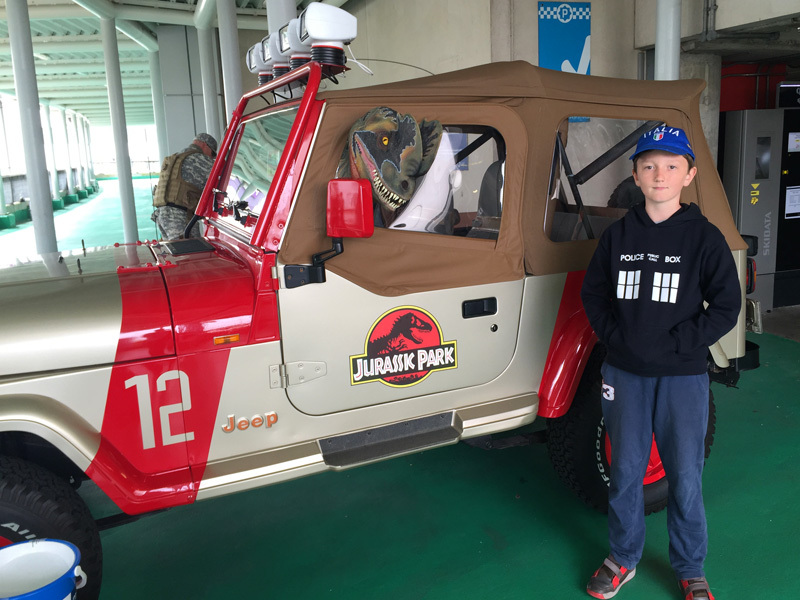 On my way in I had my photo taken with a jeep from Jurassic Park and played peekaboo with a dinosaur! 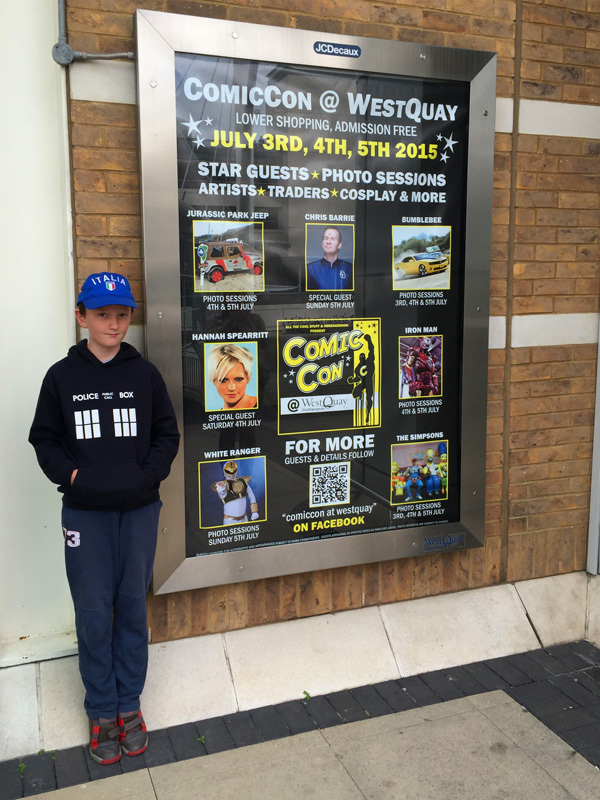 The Comic Con was held on the lower floor of West Quay, a shopping mall in Hampshire. So much fun was packed into such a small space in the middle of all the shops. 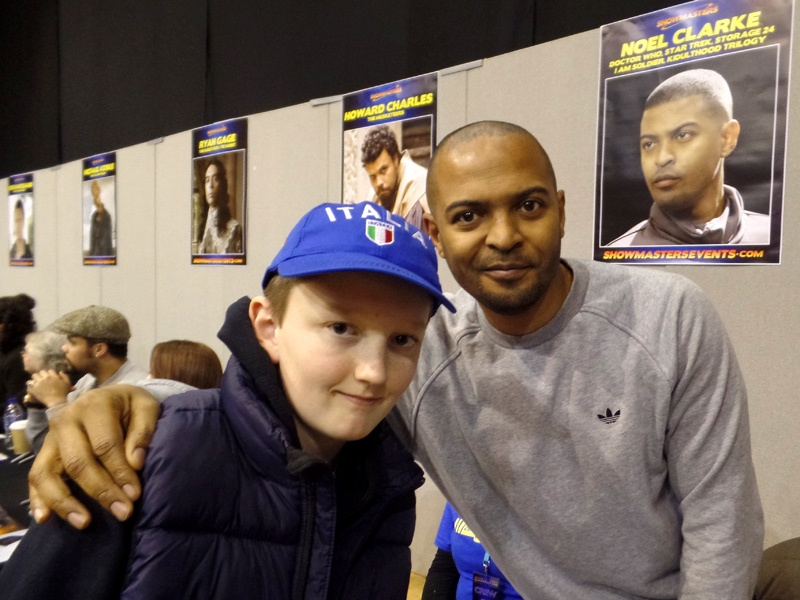 First I met Ross Mullan who played The Teller in Time Heist (2014). 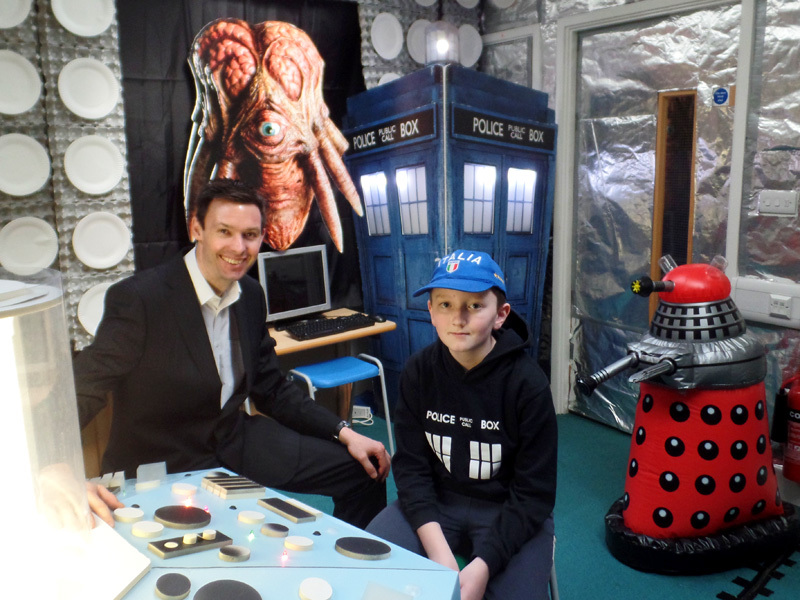 Ross has also played a Silent in The Time of the Doctor (2013) and was The Numbercatcher in Numberjacks (which was one of my first scares when I was little!) and he is a White Walker in Game of Thrones. I was expecting Ross to be English but when I met him I found out that he was Canadian – and kind too! I asked him my Golden Questions – plus one more. 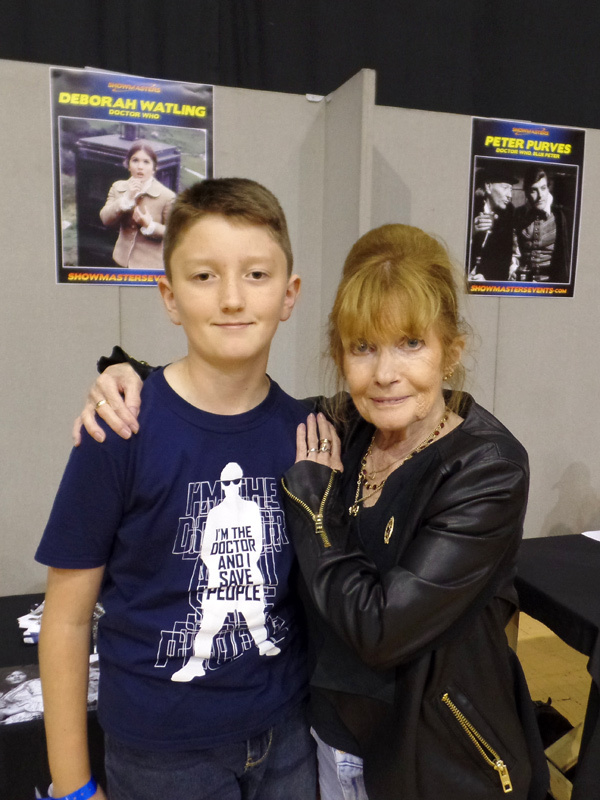 I asked him for his favourite Series 8 episode and he said that apart from his own episode, Mummy on the Orient Express (2014) was his favourite one. One of Ross’s friends played the Mummy (The Foretold), which was a part that Ross really wanted himself but he was pleased for his friend as he did a great job. 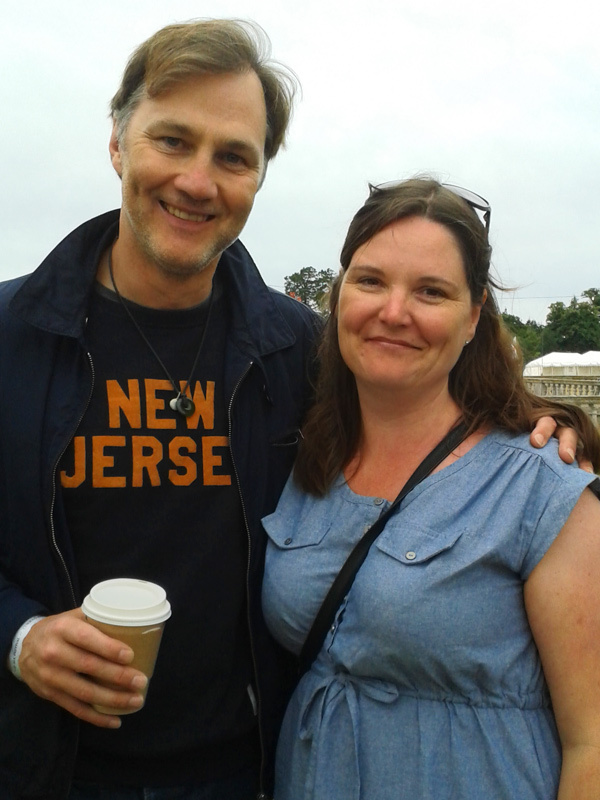 I asked him where he filmed Time Heist and he said he filmed mostly in a studio and a warehouse, and the end was filmed in a park. He said that the warehouse was VERY cold for the other actors but that was good for him; he was wearing his Teller costume! 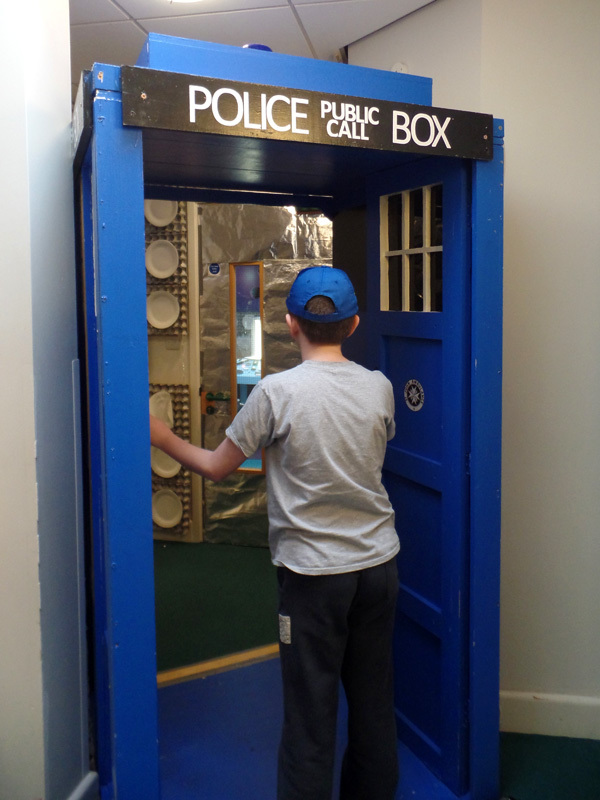 If he could go anywhere in time and space Ross would like to go to London in the 1960s. Groovy! 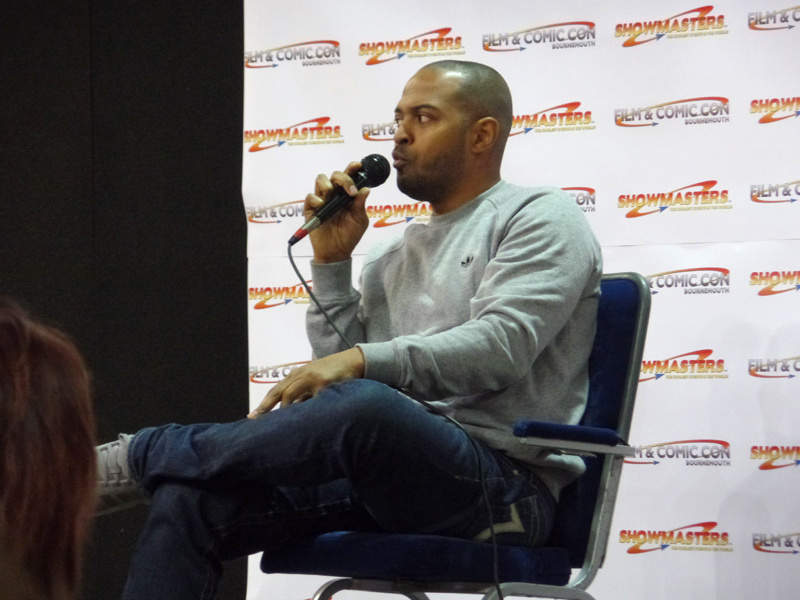 Ross doesn’t know if he will appear in Doctor Who Series 9 yet but he hopes to work on the show again in the future. 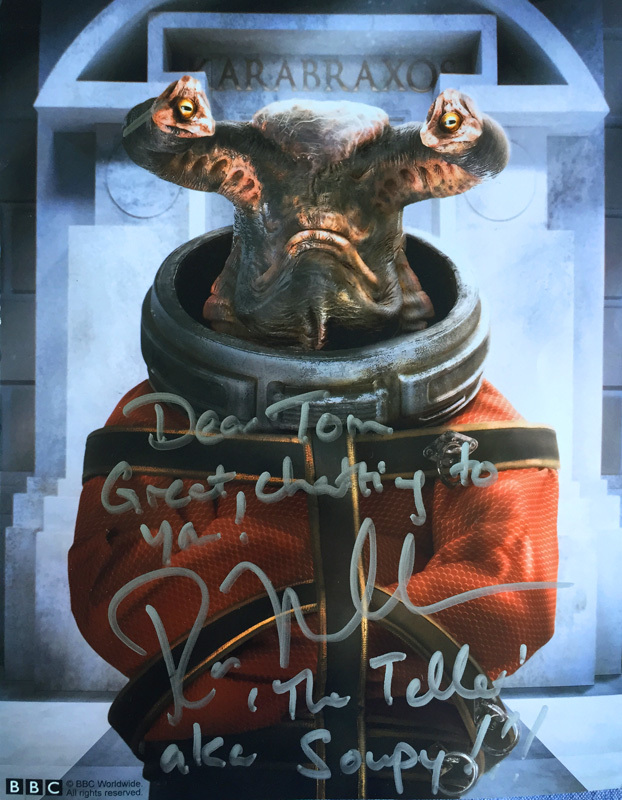 I told Ross that my nickname for The Teller is ‘Soupy’ because he turns people’s brains to soup. 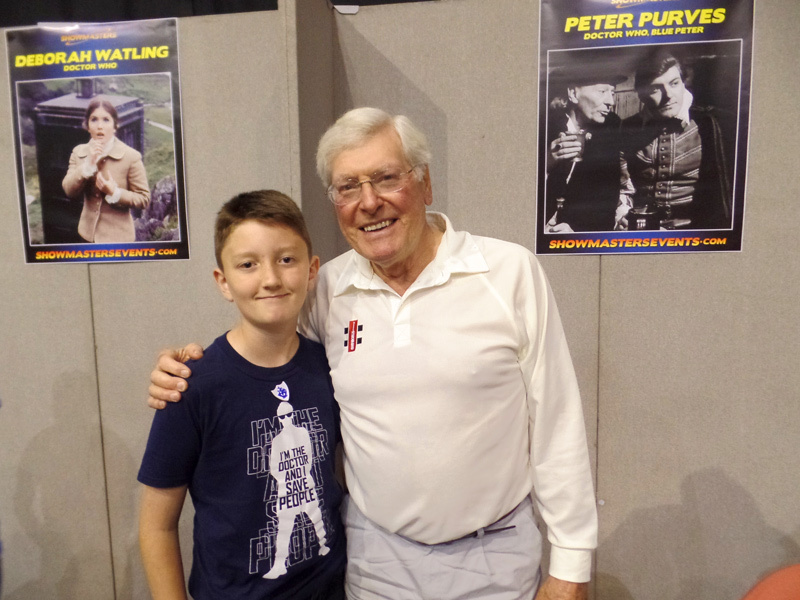 Ross then signed his autograph on a picture of him as The Teller – and signed it from ‘Soupy!’ I had my photo taken with him and he was very tall indeed- 6ft 4 inches. 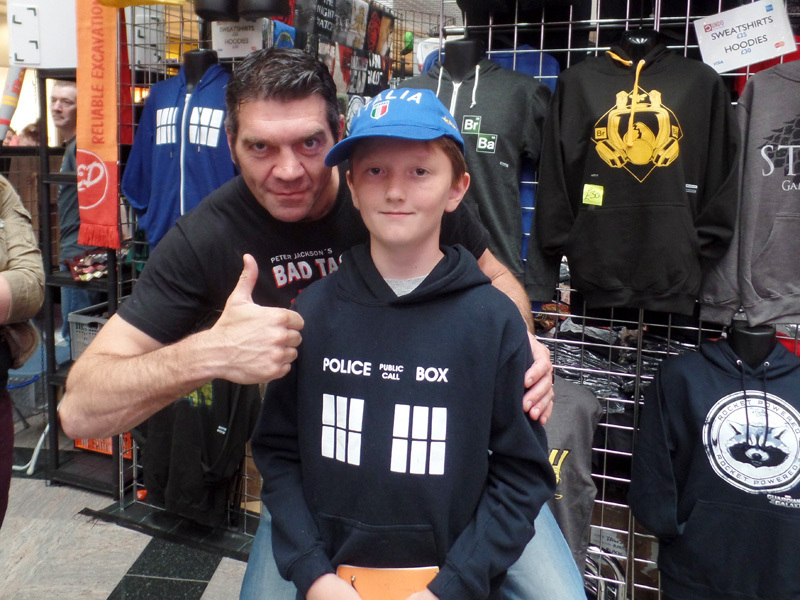 Next to Ross was his White Walker friend Spencer Wilding who has appeared in Doctor Who lots of times, most famously as The Minotaur in The God Complex (2011) but also as Skaldak and the Wooden King. 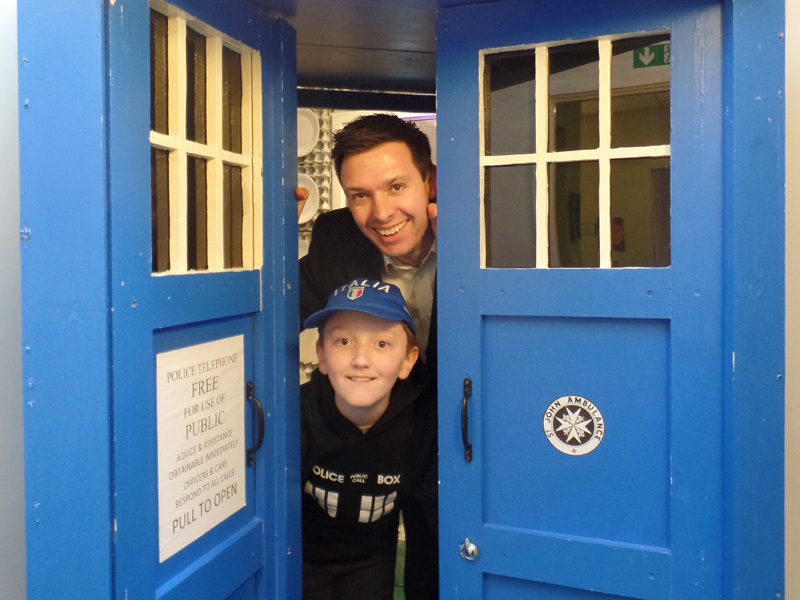 I asked Spencer what his favourite episode of Series 8 was but all his answers were from the era of his favourite Doctor Matt Smith. The God Complex, Cold War (2013) and The Doctor, The Widow and the Wardrobe (2011) – co-incidentally all the episodes he appeared in! The God Complex was filmed in Cardiff in the studios before the move to Roath Lock and some of the hotel scenes were filmed in a real hotel by the sea. 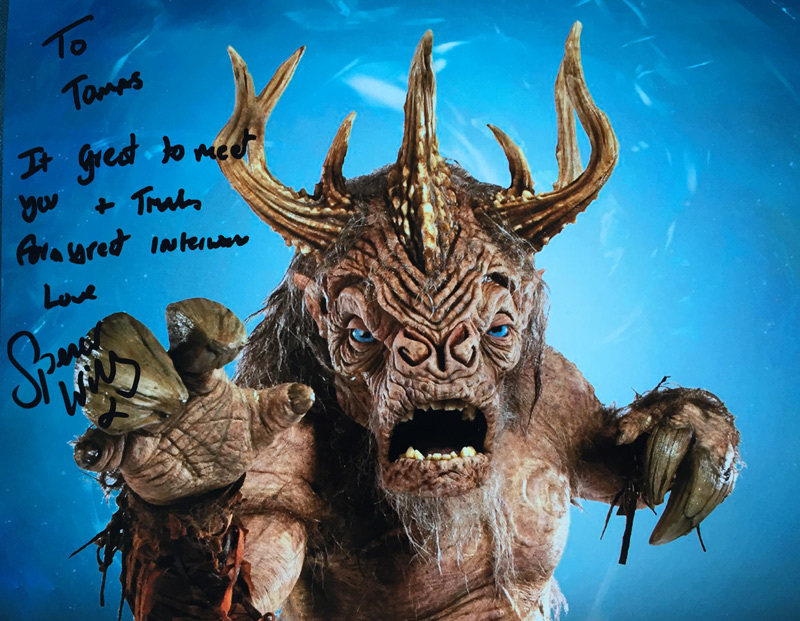 His Minotaur costume was an animatronic suit that he could get in and out of in an hour. If Spencer could go anywhere in time and space he would go to Mars but he would like to teleport there as he wouldn’t want to spend months travelling there! 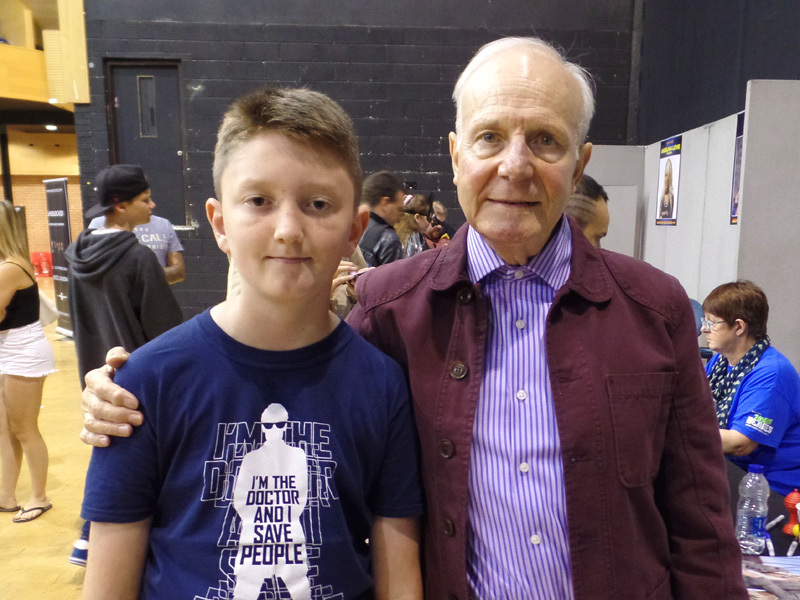 I asked Spencer if he is in Doctor Who Series 9 and he said that he couldn’t tell me. 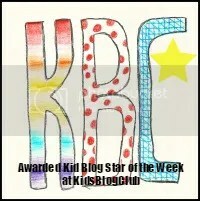 Hmmm – that got me thinking! I hope he is. 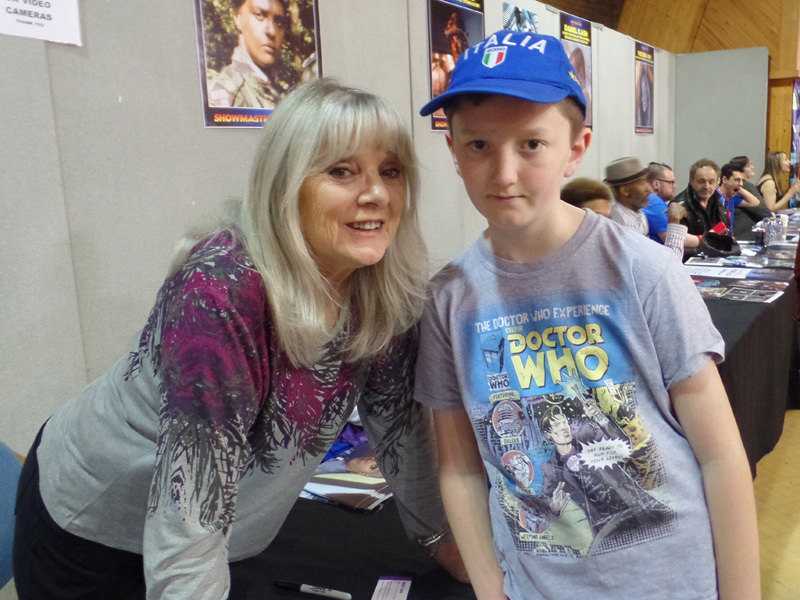 Also at the Comic Con was Matthew Dale who played Little John in Robot of Sherwood (2014). 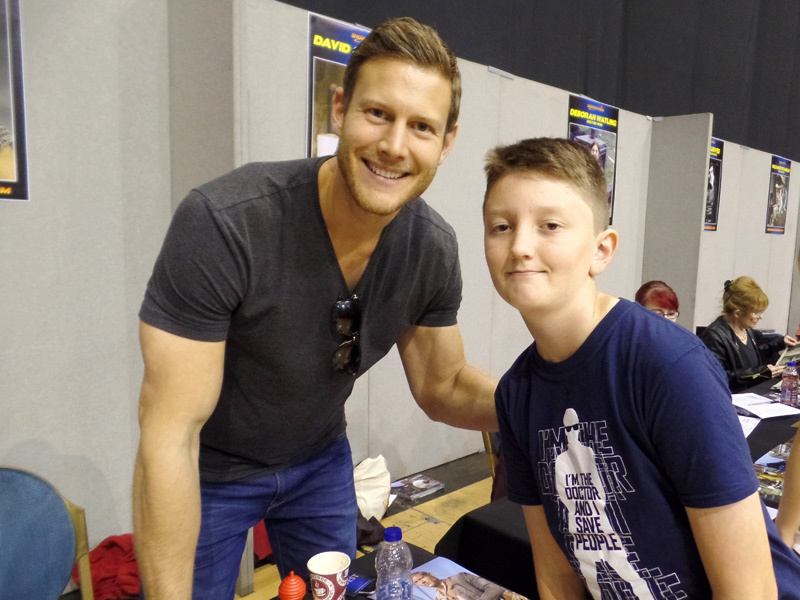 I met Matthew at Southampton Comic Con 2 in March and it was nice to meet him again. 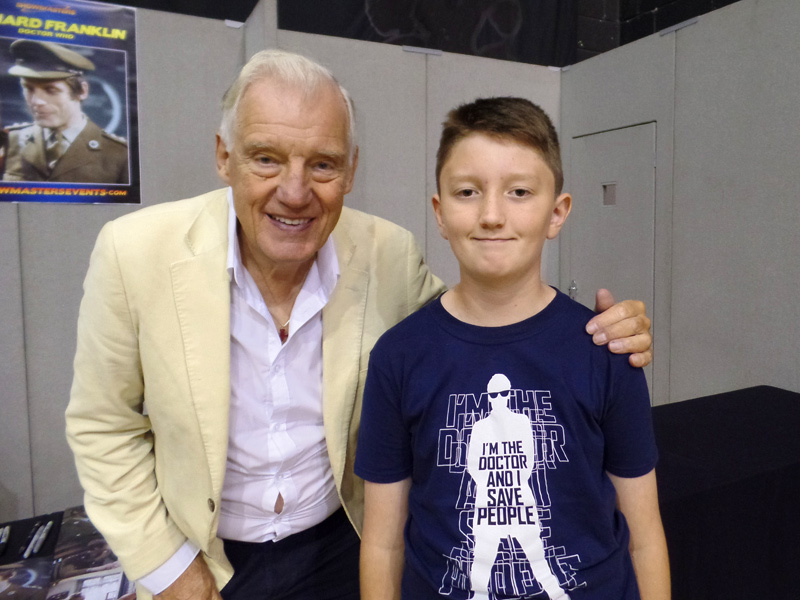 He told me about the Pendragon Charity Day which is a fundraiser that will be held in Southampton at Waterstones West Quay on 11th July 2015 – Matthew will be there along with other Sci-Fi stars. I hope I can pop along! 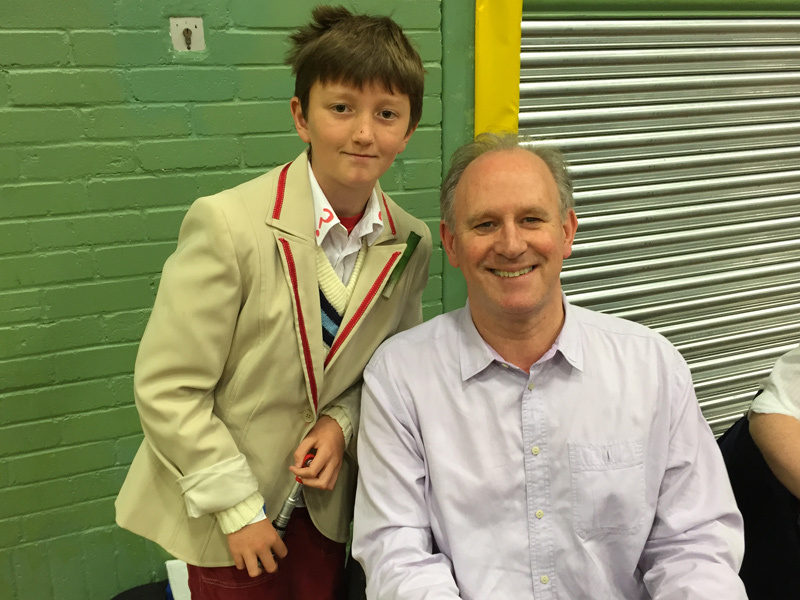 After I met the Doctor Who stars I looked at all the other stalls – Chris Barrie from Red Dwarf was signing and there were lots of chances to buy collectables or have your photo taken. 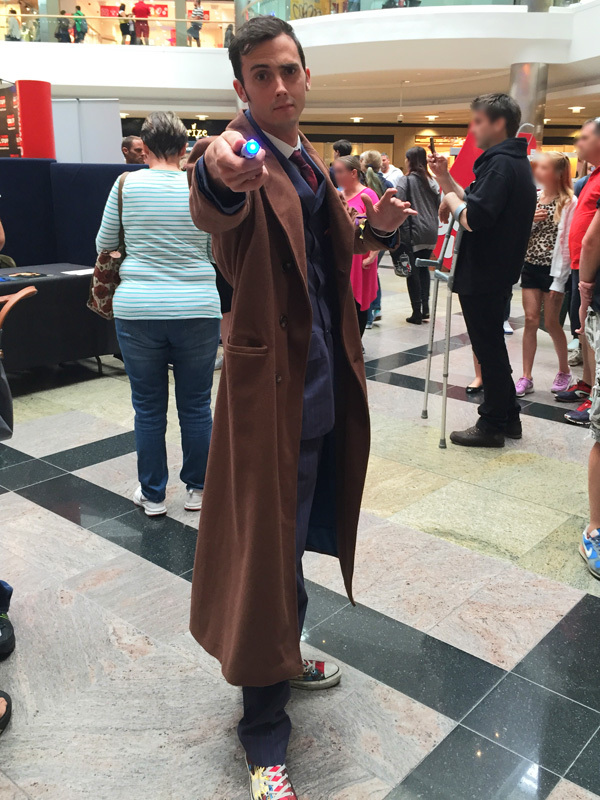 There were also some Cosplayers, including Ash who was dressed as the Tenth Doctor in a very good costume. I think he is a great Cosplayer, he looked very cool. 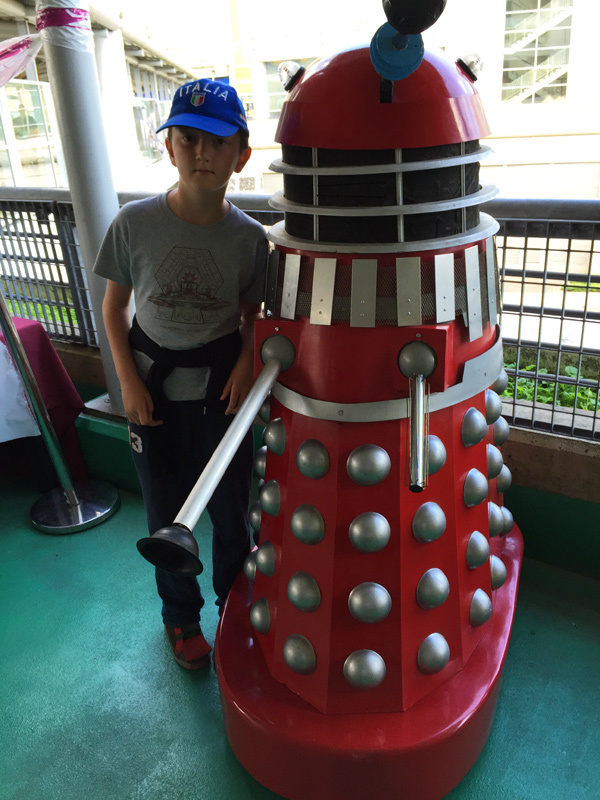 I spent the afternoon shopping in Southampton but when I returned to my TARDIS I met Sci Fi Steve and his red Dalek! It was very realistic but I wasn’t scared. Steve offered me a ride in his Dalek but I said no because last time I rode in a Dalek I got very dizzy. Thanks for offering though Steve :). I enjoyed my day in Southampton and I’m looking forward to Nerdageddon’s DEF-Con 4 which will be even bigger than DEF-Con 3! 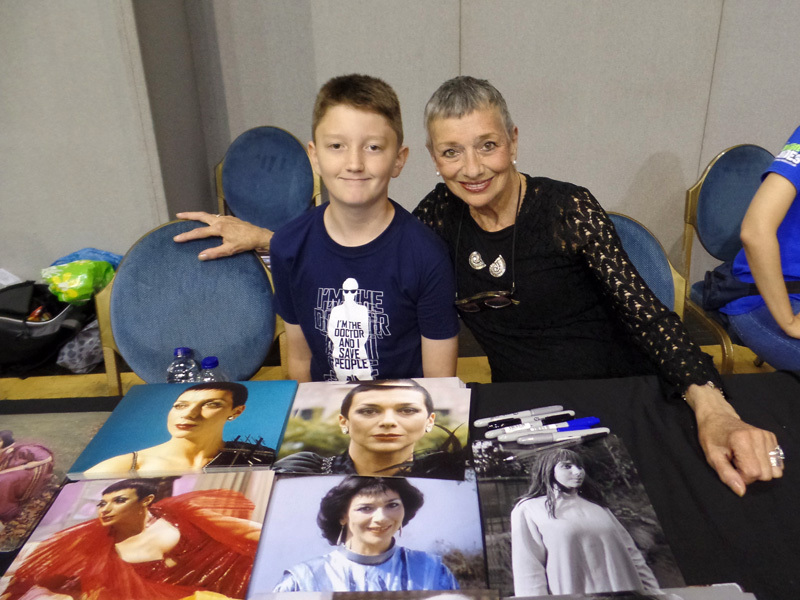 I love going to Comic Cons – they are lots of fun and I meet good people. 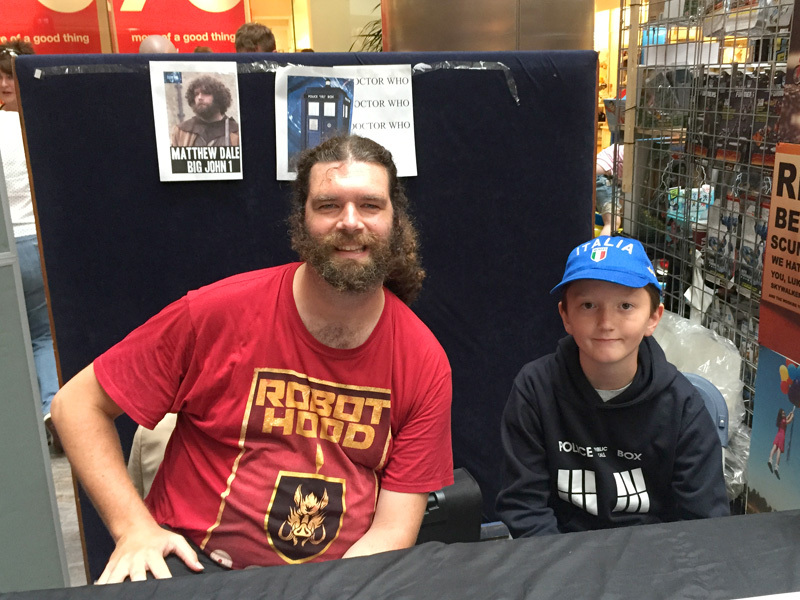 Thank you for reading, thank you to everyone who organised the Comic Con @ West Quay and to Ross, Spencer, Matthew, Steve and Ash for being part of my blog. 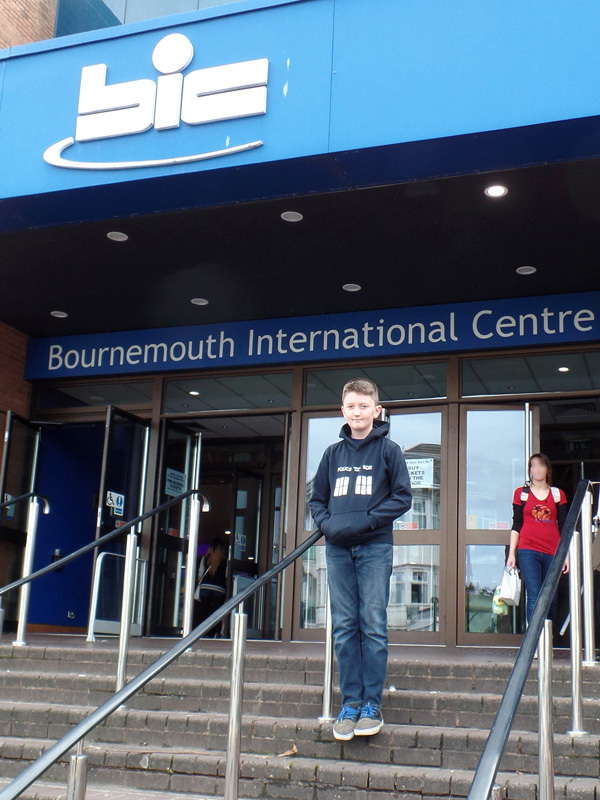 See you soon I hope – goodbye! 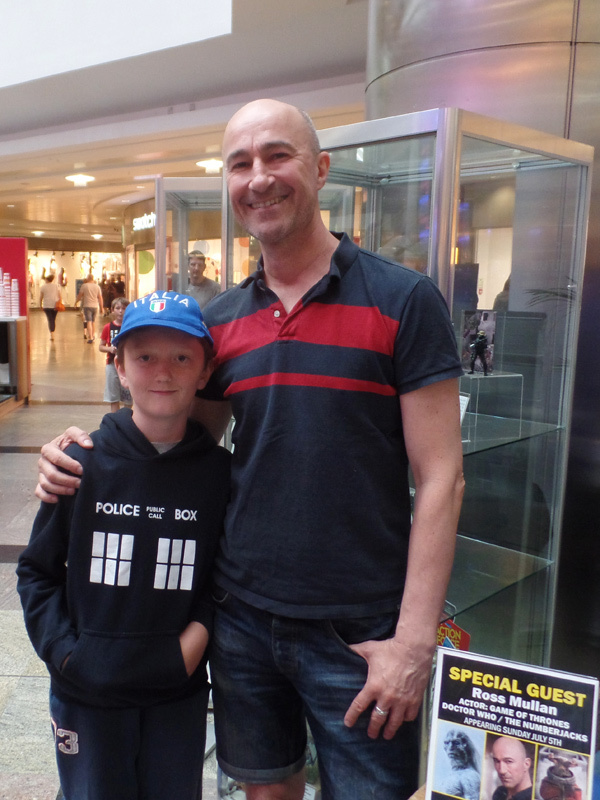 Hello and welcome to another post – but this post is very special as I am interviewing Doctor Who Monster Actor Jon Davey! 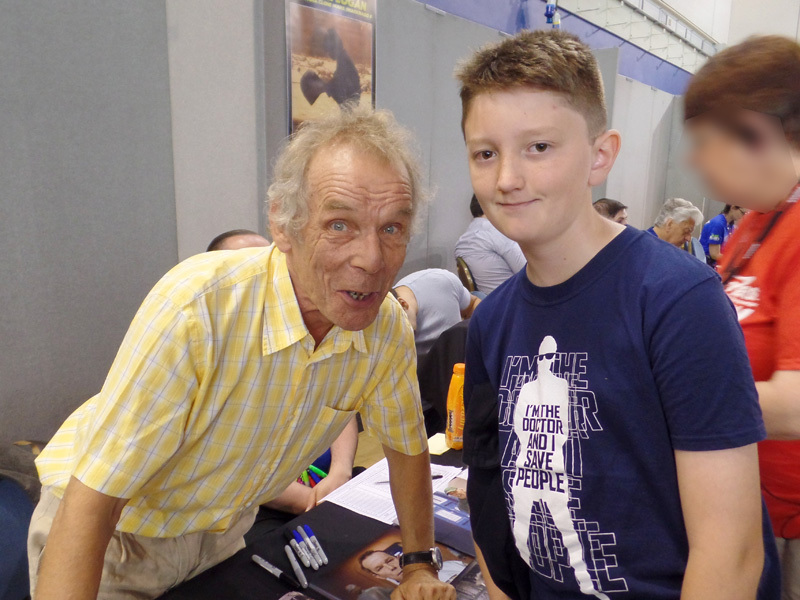 I’ve met Jon three times, at the Fleet Air Arm Museum Dalek Invasion, the Timeless Collectors Fair and recently at the Doctor Who Symphonic Spectacular in Wembley. 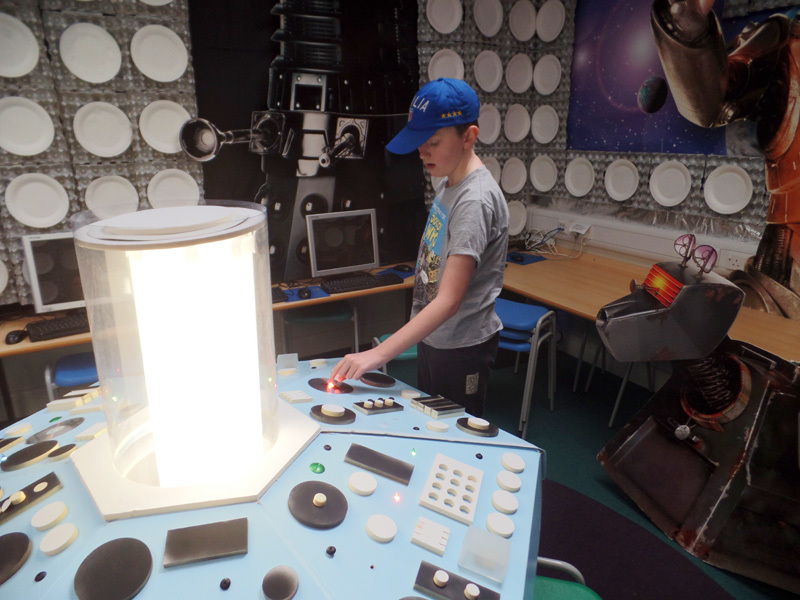 Also when I was at the Doctor Who World Tour in Cardiff he was playing one of the Daleks – I didn’t realise at the time that there were real people inside! 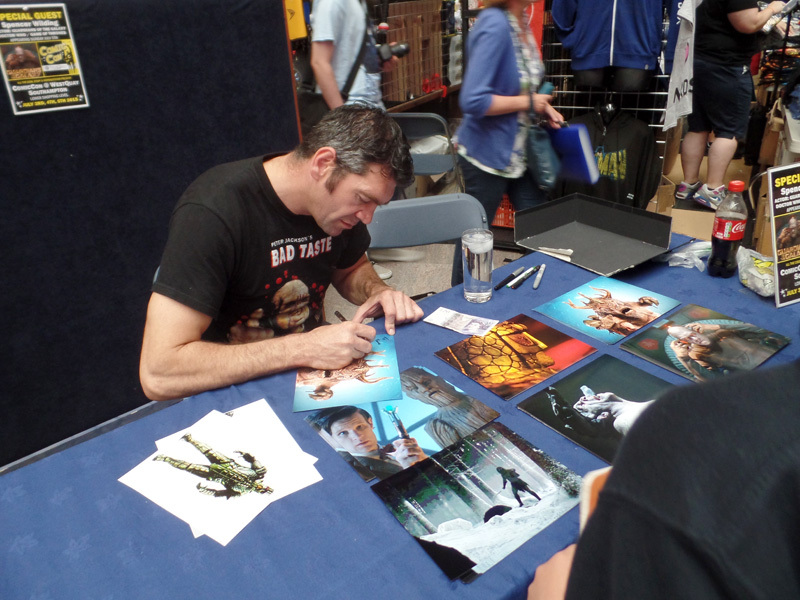 If you get the chance to meet Jon at a Doctor Who convention make sure you say ‘Hi’ as he is really friendly and can tell you all about being a Monster Actor and about wearing the make-up and costumes! Here is the interview of Jon Davey! Hello Jon! What is the favourite monster you have played? Probably the headless Cyberman from the Pandorica episode. 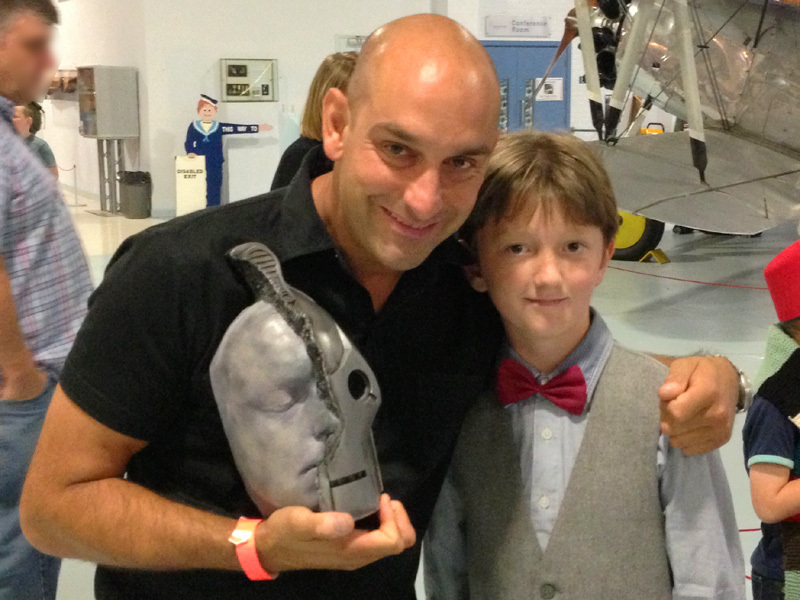 It was amazing to see myself on screen with an arm and head brilliantly removed. What monster would you like to play? I’ve always had a vivid memory of the Sea Devils emerging from the water. 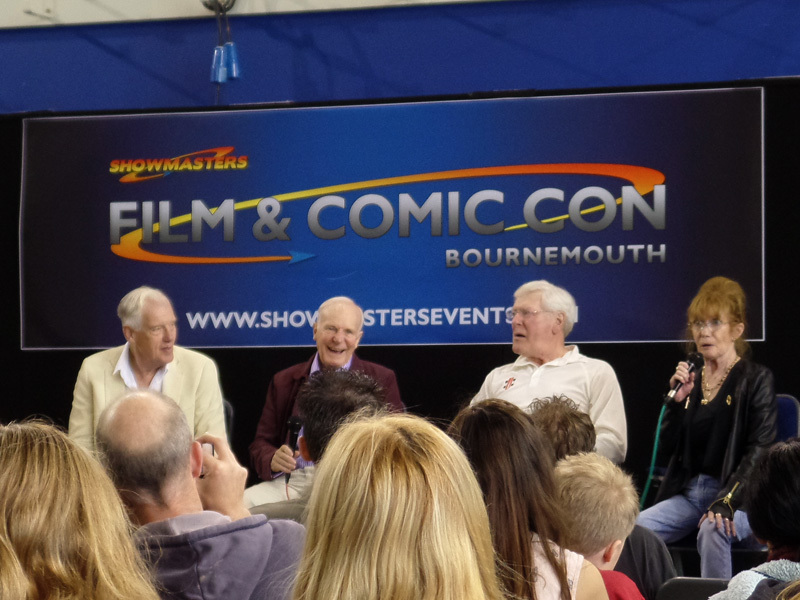 They were pretty scary as I remember so if they ever come back I would be honoured to play one. What is it like when you are in a costume and make-up? Most of the costumes have slightly limited vision so rehearsing our moves with “heads off” is always essential. After that it is normally counting our steps to make sure we don’t collide with anyone or anything. The costumes can get quite warm so doing as little as possible when we are not shooting will help generate superfluous heat. Also inertia can be our enemy, standing still in a large costume can be harder than moving so when we are resting you will normally see the monster doing small stretching exercises to keep the body supple. A fun sight to be seen! What monsters do you play in the Doctor Who Symphonic Spectacular? 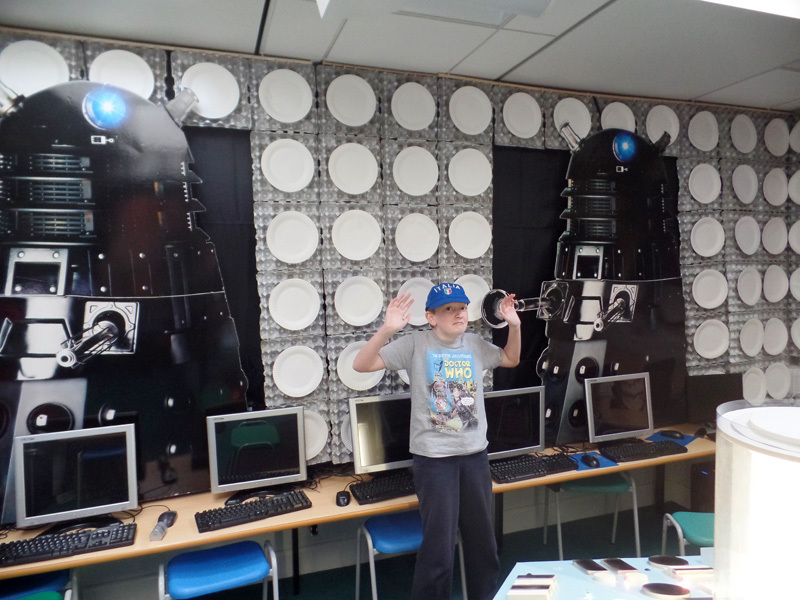 This year I played the Judoon and Dalek, which was great fun, and got a few screams from the audience. 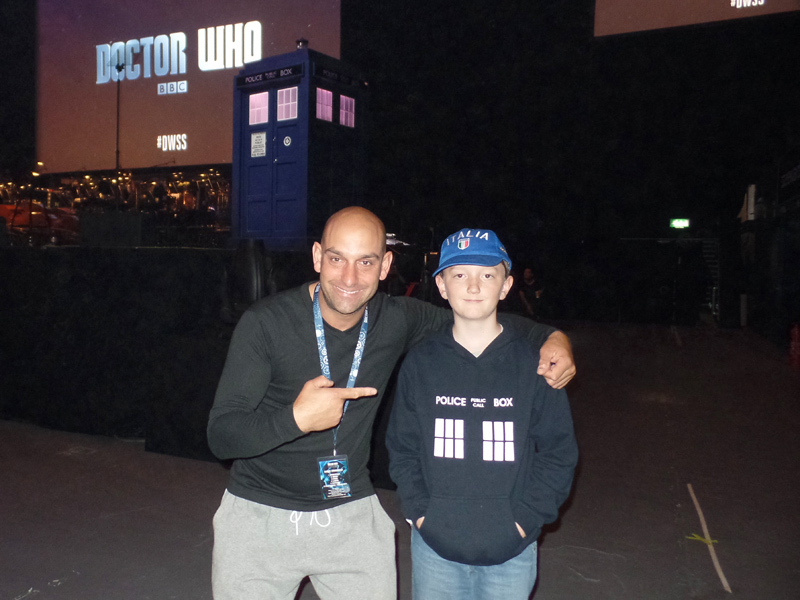 Where have you been with the Doctor Who Symphonic Spectacular? I have just been on the UK tour this year as well as Adelaide, Perth, Sydney and Auckland on the Australia and New Zealand tour earlier this year. 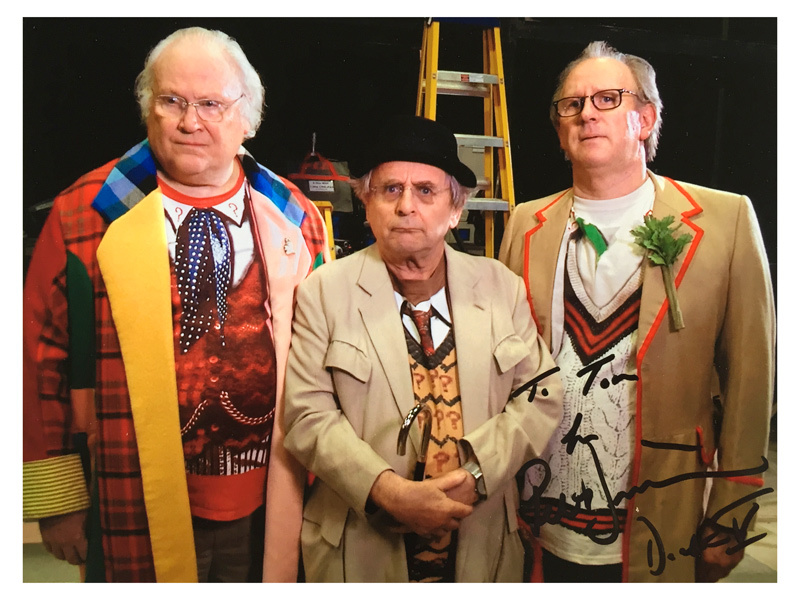 Last year we went to Melbourne, Brisbane and Wellington on ANZ tour too, it has been amazing taking Doctor Who to the overseas fans. 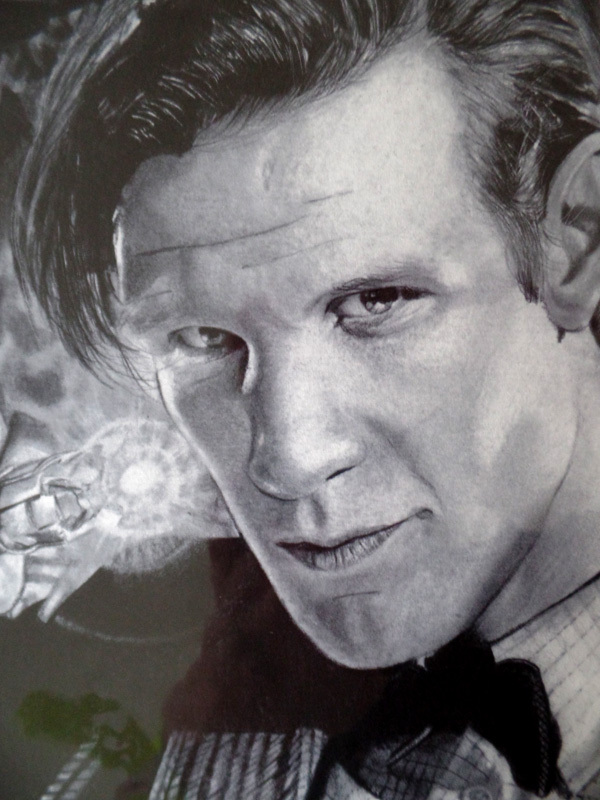 Do you have a favourite Doctor Who episode? Probably Blink and Death in Heaven. Great bit of story telling on both of these episodes. Do you think you would be a good Doctor? I would like to think so – hopefully if they are looking for Mark Strong to play the Doctor and he turns it down, I could step up to the role! What do you do when you aren’t playing a monster? I’m a still photographer and film maker. I spent 8 years filming mostly stop motion animated music videos for the likes of Radiohead, Scissor Sisters and Mcfly. This helped me with understanding timing and movement which helped with my monster work. Are you in Doctor Who Series 9? The first rule of Doctor who Series 9 is you don’t talk about Doctor who series 9 😉 I can answer that question this autumn! If you could go anywhere in time and space, where would you like to go? Probably the moment before the Big Bang to see what I was like before time existed. I hope you have enjoyed this interview with Jon, I would like to say a BIG THANK YOU to Jon Davey for taking the time to answer my questions. 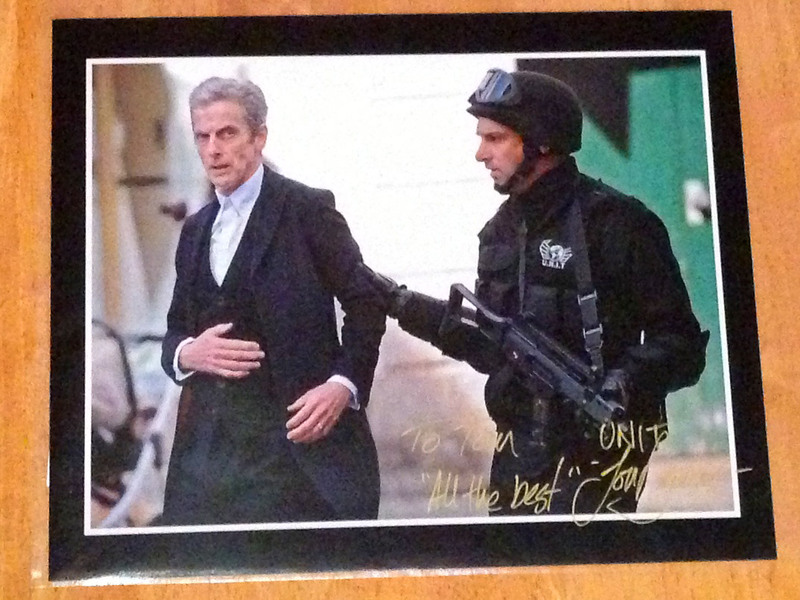 I will be keeping an eye out in Series 9 for him just in case he is in it! Thanks for reading and I will see you soon I hope!